From France we thought we’d add another country to our tally by heading north through Luxembourg. It’s a new country for Julie as I’ve been here before albeit briefly, and as it was for work I didn’t really get to any of the sights. 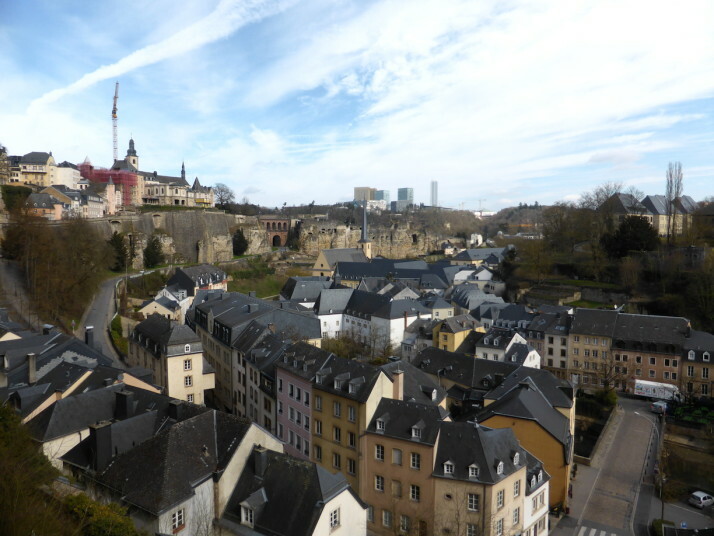 The central old town of Luxembourg City is contained within the boundaries of an ancient fortress, even though most of the defences no longer exist. As a result it’s quite a compact place to visit, and it was straightforward to see the main sights – notice I said straightforward and not easy.. the area’s soft limestone means the river Alzette has cut a gorge through the landscape so walking around Luxembourg City means climbing up some steep streets! Inside the Casemates Bock, the passages get narrower the further you go and some are quite claustrophobic! The first sight on our short itinerary was the impressive natural defences of the Casemates Bock. In 963 Count Siegfried bought an existing castle atop the cliffs above the Alzette and started enlarging and fortifying the area against attacks, but it was the Spanish (in 1644) and then the Austrians (in 1737) that created the elaborate complex of underground tunnels and cannon slots that survive today. 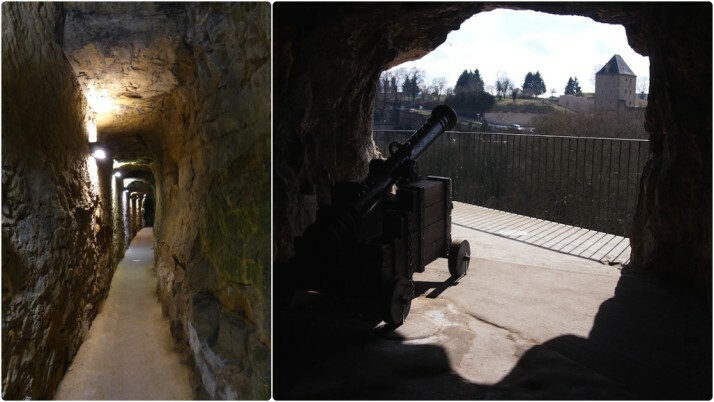 We were surprised how extensive they are, with space for 50 cannon, a garrison of 1,200 soldiers, workshops, a kitchen and it even has its own 47m deep well! From the city end of the Casemates we took the panoramic Wenzel walking path, and found a convenient free lift that went down the cliff – but the ‘G’ in this lift doesn’t stand for the ground floor, it stands for Grund! The Grund is a small district that lies at the eastern end of the city on the banks of the river. Its tall, picturesque houses are hemmed in by the river in the middle and the cliffs at their back, criss-crossed by narrow streets. Although the area is full of cafes and restaurants, it was a quiet area to stroll through. 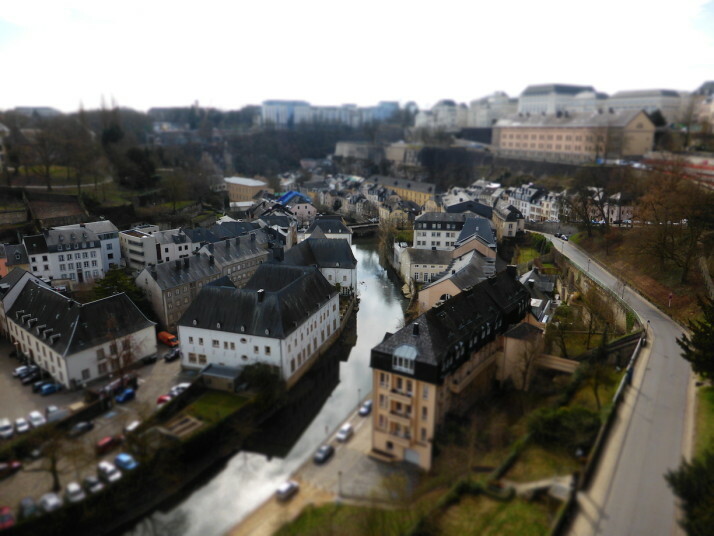 After a walking loop and spot of lunch in The Grund we took the lift back up the cliff to wander through the narrow streets of Luxembourg City proper. It’s compact, dense, and home to international brands, boutique shops, and artisan pubs, cafes and restaurants. Three of the sights that stood out for us were the Notre-Dame Cathedral with its lovely curved stained glass apse, the Gëlle Fra or statue of the Golden Woman which commemorates the Luxembourgers who fought against Germany in the 2nd World War, and the beautiful Grand Ducal Palace, official residence of the Grand Duke and his family, with a guard stationed outside. 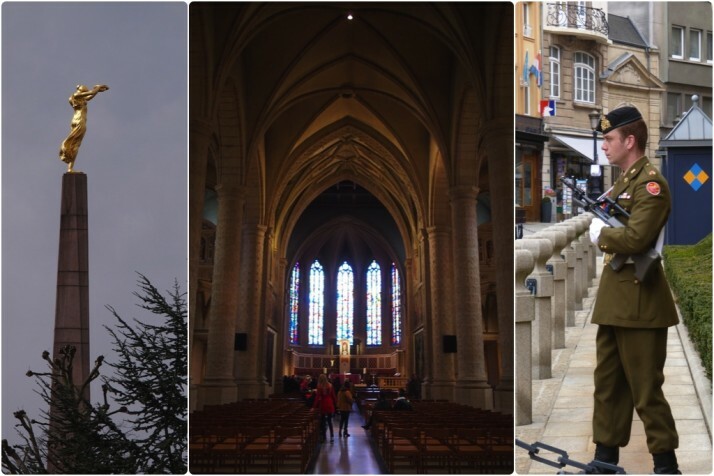 What photo takes you right back to Luxembourg? 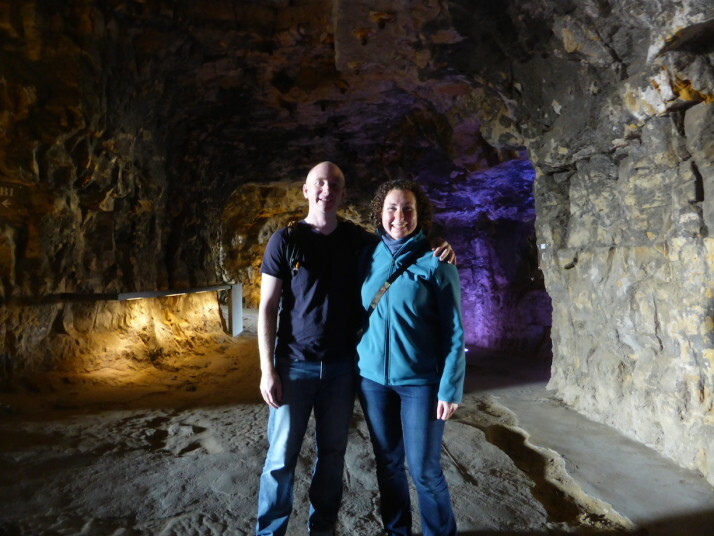 Us in the amazing UNESCO Casemates Bock, as you can see we almost have the place to ourselves! Summarise Luxembourg in three words. Hilly – from our hostel next to the river we climbed up to the Casemates, took the lift down to the Grund then back up and finally descended back to the hostel, not to mention all the stairs inside the Casemates! Multilingual – we read that Luxembourgers are taught Luxembourgish, German, French and English at school, and can elect a further ‘foreign’ language! Quiet – we visited near the end of March and while the wind was chilly it was otherwise pleasant and almost completely devoid of other tourists. .. you’re standing underground, but have views to your left and right down the river valley that surrounds you on 3 sides.. where are you? In the Casemates Bock of course – we’ve not seen another place like it! What one item should you definitely pack when going to Luxembourg? Your lunch! If you bring a packed lunch or pick up something healthy from the many shops in the centre, you can stop pretty much anywhere on the many self-guided walks around the city and take in the amazing views while fortifying yourself for the next climb. This entry was posted in Places and tagged Castle, Church, Luxembourg, Round Up on April 5, 2015 by Andrew.